This is our detailed review of the highly buyer rated Flymo Easi Glide 300 Electric Hover Collect Lawn Mower This hover mower came out as the number two buyer rated hover mower, on our top 5 list that is currently available in the UK. The brand is of course a well known brand in the UK. They currently produce gardening tools for the UK market, that include; mowers, grass trimmers, lawn rakes, hedge trimmers,leaf blowers and vacuums. 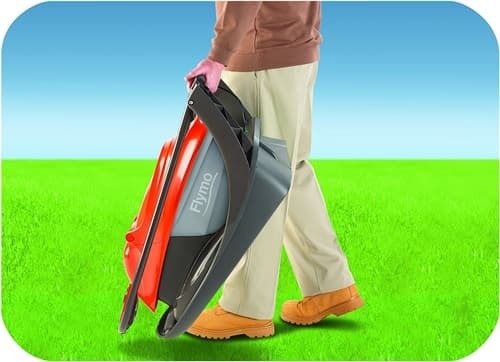 Flymo are best known in the UK however for producing and manufacturing a range of hover mowers. This Easi Glide 300 is one of the best rated of these. Most hover mowers have a price of around £70-80 and this one sits slightly under that price bracket. It has a powerful 1,300 watt motor, a 20 litre grass collection box, a 30 cm cutting blade and 4 cutting heights. 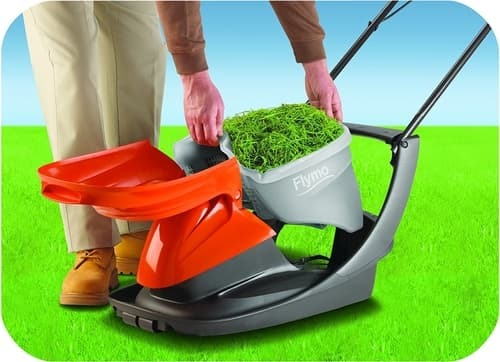 Flymo are a brand that forms part of the Husqvarna group, who are known primarily for their chainsaws, and also for their robotic lawn mowers and garden tractors. They have dominated the hover mower market in the UK for many years, and make a range of different types of hover mowers. Flymo do build all their own mowers here in the UK, and have been doing so for 50 years. Hover mowers are small, lightweight and very easy to use. That makes them an ideal choice for anyone with an irregularly shaped lawn, a sloped lawn and work well on small to medium sized gardens. They are also a good choice for someone who wants a compact lawn mower to store in a tight space. Just below we have included what we believe to be the most important features of this Easi Glide 300 model. The good thing about this mower is that it comes fully assembled straight out of the box. That means you don't have to put anything together and no tools are required. This mower is suitable for small to medium sized gardens but not for larger gardens. This mower does collect the grass but be aware that not all hover mowers do. The grass collector compacts the grass and that means you can collect more grass, and that of course speeds things up when it comes to mowing your lawns. The four separate cutting heights allow you to vary the length of the grass depending on the weather. This mower uses a metal blade for clean cutting and that reduces the risk of tearing your grass. if you are a gardener you will already know that tearing the grass ultimately results in the grass drying out, and that is a common cause of yellow grass. Many buyers turn to the Flymo brand when they are thinking of buying a good hover mower. That is because that is the most recognised brand for this type of mower. This Easi Glide 300 is one of their better options and at 84% buyer satisfaction is also one of their highest rated. Here at this website we like to read the reviews and then summarise those for you. Hopefully that will save you a lot of work having to find, read and then try to make sense of all the different buyer ratings and comments. In the pros and cons table below, we have listed in summary form both the good and bad points that buyers made when they left their reviews. There are well over 1,000 buyer reviews online so that should tell you that this lawnmower has sold in its hundreds of thousands throughout the UK and in Ireland. If you have a small to medium sized garden in the UK, then the hover mower will do a good enough job. However I have never used a hover mower that does not spit out some grass. That is down to the nature of their air blowing design. First time buyers have nothing to compare this to and for those who have used a rotary or petrol style mower, they will not be that impressed with the grass collection. I have used a lot of hover mowers, and when finished I have always had to brush down paths and back yards, sadly that is the nature of the beast. On the opposite side, if you have never had a mower with a grass collector, then you will be delighted with this one. 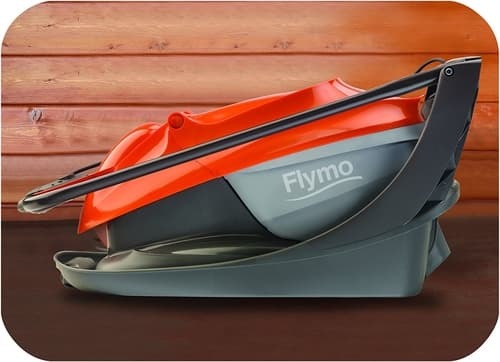 This Flymo Easi Glide 300 hover came out as the number two choice in our top 5 list of hover motors, thanks to a good solid 84% buyer satisfaction. It is well priced and will do a very good job at cutting small to medium sized gardens. You will need to clean up a little afterwards as not all of the grass will get collected into the grass container. If this is not the hover mower for you, then why not check out our top 5 list of hover mowers by clicking here. Most buyers say that this one is good quality, efficient, and works well even on long grass. 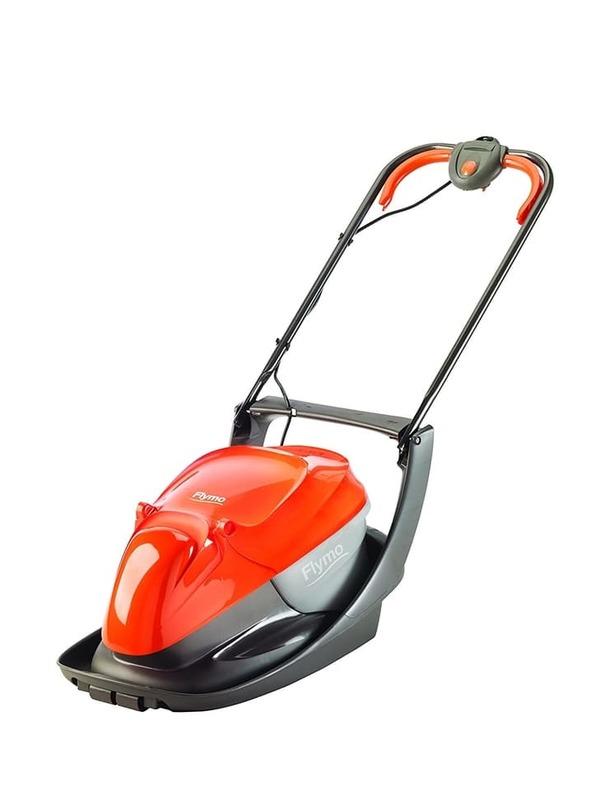 It is certainly very light compared to other types of lawnmower, and probably one of the best on the market for quick and easy storage, that take up very little room.